Highline College is nationally and internationally recognized as a premier community college, a reputation earned through the development of an institutional culture that values innovation, globalization of curriculum and community participation. It is one of 34 community and technical colleges in Washington state. The college’s main campus is located on an 80-acre wooded site overlooking Puget Sound, 20 minutes south of downtown Seattle. Classes are also provided at the Marine Science and Technology Center at Redondo Beach, and additional service-area locations such as Burien and White Center. 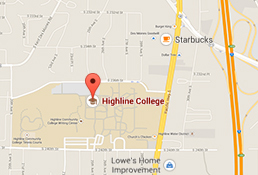 Highline was founded in 1961 as the first community college in King County. It serves approximately 16,900 students and has in excess of 350,000 alumni. While the majority of Highline’s students live in southwest King County, the number of students who come to Highline from other states and countries from around the world has grown significantly in recent years. More than half of students enroll in daytime classes; the rest attend evening classes. Highline College is accredited by the Northwest Commission on Colleges and Universities, an institutional accrediting body recognized by the Council for Higher Education Accreditation and the secretary of the United States Department of Education. The commission’s offices are located at 8060 165th Ave. N.E., Suite 100, Redmond, WA 98052-3981. The Nursing program AAS degree at Highline College is approved by the Washington State Nursing Care Quality Assurance Commission and accredited by the Accreditation Commission for Education in Nursing (ACEN). Graduates qualify to sit for the National Council Licensure Examination for Registered Nurses (NCLEX-RN). The Respiratory Care program AAS degree at Highline College is accredited by the Commission on Accreditation for Respiratory Care. CoARC (www.CoARC.com). Commission on Accreditation for Respiratory Care, 1248 Harwood Road, Bedford, Texas 76021-4244 (817) 283-2835. The Medical Assistant Certificate program is accredited by the Commission on Accreditation of Allied Health Education Programs (CAAHEP), upon the recommendation of the Medical Assisting Education Review Board of the American Association of Medical Assistants Endowment (MAERBAAMAE), 25400 U.S. Highway 19 North, Suite 158, Clearwater, FL 33763, (727) 210-2350. The Certificate of Polysomnographic Technology program at Highline College is accredited by the Commission on Accreditation of Allied Health Education Programs (CAAHEP). CAAHEP is the largest programmatic accreditor in the health science field. In collaboration with its Committees on Accreditation, CAAHEP reviews and accredits over 2000 education programs in twenty-two health science occupations. CAAHEP is recognized by the Council for Higher Education Accreditation and is a member of the Association of Specialized and Professional Accreditors. The Associates of Applied Science in Polysomnographic Technology program at Highline College is accredited by the Commission on Accreditation of Allied Health Education Programs (CAAHEP). CAAHEP is the largest programmatic accreditor in the health science field. In collaboration with its Committees on Accreditation, CAAHEP reviews and accredits over 2000 education programs in twenty-two health science occupations. CAAHEP is recognized by the Council for Higher Education Accreditation and is a member of the Association of Specialized and Professional Accreditors. Highline College is valued as the educational crossroads where dreams are shaped, communities created and excellence achieved. Access: We believe education should be available to all who seek it. Collaboration: We value teamwork, joint responsibility and ownership. Community: We value our community and are dedicated to serving its educational needs. Diversity: We respect the rights and perspectives of the diverse populations, who live, learn and work in our community. Excellence: We strive for the highest quality in all our programs and services. Integrity: We believe in honesty and trustworthiness in all our college practices. Internationalization: We value a global perspective and respect cultural diversity. Learning: We develop an interactive, creative and learner-centered environment that supports student success. For more information on Highline’s strategic plan, visit https://www.highline.edu/about-us/.